I have wasted far too much of my time killing zombies. This is what Paul Krugman calls ideas or alleged facts that, despite being shown to be wrong countless times, keep coming back to life. In terms of anti-Keynesian mythology, the zombie I have spent too much time on is that 2013 UK growth showed austerity works, but I’ve also done a bit on the mistaken idea that US growth in 2013 shows that Keynesian multipliers are zero. (I’ve been told that what I have done in the US case is deficient for a couple of reasons - neither of which I accept - but those saying this have never shown that doing it their way makes any difference. Instead they prefer to stick to gotcha economics. You can draw your own conclusions from that.) But these are particular episodes for particular countries - what about the big picture? I happened to be using the IMF’s datamapper recently, and it contains the following for GDP growth in the advanced economies. There was slow growth in the early 80s, but that was followed by years of around 4% growth. Another slow growth period in the early 90s, followed by years of around 3% growth. The same again for the 2000s. We then had the massive recession of 2009, followed by 3% growth in 2010. Then four years of growth below 2%, which would have been classed as a downturn based on previous experience. Why has there been such a pathetic recovery? There is a simple, entirely conventional answer, which perfectly fits the timing: fiscal austerity. As I set out here, growth from 2010 in the US, UK and Eurozone would have been closer to previous recoveries without cuts in government consumption and investment. Now of course there are other explanations. The most obvious is that recoveries from financial crises have been weaker and more prolonged in the past. However a point that is not made often enough is that the austerity explanation and the weak finance explanation are quite compatible with each other. In a recession private spending and public spending on goods and services do not compete, so even if private spending has been weak because of difficulties in obtaining finance, austerity in the form of public spending cuts will still reduce GDP. Furthermore, an inability by consumers to borrow can magnify the impact of cuts in transfers or increases in taxes on consumption. The only theoretically plausible explanation for why austerity in the form of cuts to government consumption and investment will not reduce output in a demand deficient recession is if monetary policy eases to offset the cuts. That explanation suggests weak growth since the recession is a deliberate choice by monetary policy makers, and it gets more implausible as each day passes. 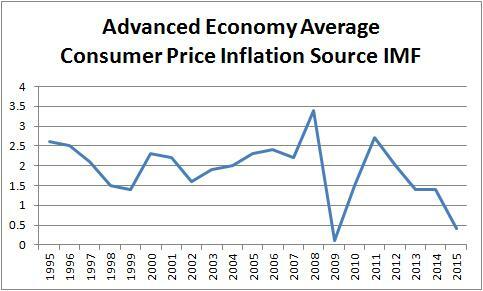 Here is consumer price inflation from the same source. Whereas inflation wobbled around 2% during the Great Moderation, in 2013 and 2014 it was below 1.5%, and this year is heading towards zero. A coda to my previous post, where I reported on some simulations presented in the Bank of England’s new blog. My final paragraph started: “The blog does not discuss the policy implications, but they are pretty obvious.” I went on to say what I thought the implications were. Tony Yates thinks that maybe there was a hidden meaning in the sentence I wrote. The hidden meaning was: ‘see how subversive the new blog is: they are allowing staff to communicate that they think the MPC should be overshooting the target’. When Tony first raised this possibility with me on twitter, I just had to laugh, for two reasons. The first is that I had never imagined what I wrote could be interpreted this way. I am an academic, not a journalist trying to gain kudos by embarrassing the Bank. I am interested in what policy should be, not what some Bank staff think it should be. The second is that Tony’s imagined interpretation of what I had written was a perfect illustration of the kind of old Bank thinking that used to make it such a closed institution. This kind of thinking subjects each possible release of economic analysis, however technical, to the following test. Could you imagine a malevolent journalist taking this analysis and using it to infer something about what policy might be or what some people in the institution think policy should be? The imagined journalist could be both very knowledgeable and quite stupid. If the answer is yes for any combination of these things, the analysis should not be released. Now Tony is the last person to support such an attitude, but by imagining I had some hidden meaning, and then putting his imagination into print, he just encourages the old way of thinking. As far as I can see some staff members published a piece of technical analysis, and left those reading it to draw any policy conclusions they wished. Now what on earth is wrong with that! This is a short post to celebrate an important innovation at the Bank. They now have a blog, which not only has a great name (which those who have not been to London may need a subway map to understand), but looks like being an invaluable addition to the UK and economics blogging scene. As I suggested here, this is another in a long line of small innovations made possible by appointing Mark Carney as Governor. Those who experienced previous regimes can hardly believe it. The blog promises a mix of posts in terms of both content and wonkishness, and to start we have an easily understandable discussion of the implications of driverless cars for the insurance industry, and a more technical piece on macro. The idea behind the macro post is however fairly simple. If interest rates cannot go below some lower bound, the distribution of forecast outcomes will be skewed. If bad things happen, things will be a lot worse than if good things happen. The novelty is to use what are called stochastic simulations of the Bank’s main macro model to quantify this (using, I have to add, a methodology proposed by one of my former Oxford PhD students – well done Tom). Here is a fan chart for inflation which I think is self-explanatory. The blog does not discuss the policy implications, but they are pretty obvious. As Brad DeLong has recently pointed out (it’s a point that I and others have also made), with non-symmetrical outcomes like this, you should not choose the policy based on what is most likely to happen. Instead you bias your policy to shy away from the very bad outcomes. So in this case instead of aiming for 2% inflation as the most likely outcome, you aim for a policy where the most likely outcome is above 2%, to avoid a situation where the economy hits the lower bound for interest rates. To put it intuitively, when walking along a narrow path beside a cliff, it is natural and probably wise not to walk in exactly the middle of the path. What do you do when a well known macroeconomics blogger says you have made a claim which you have never made? You have in fact clearly said the opposite, and the claim you are supposed to have made is obviously silly. Ignore it maybe? But then you get comments on your own blog expressing surprise at how you can make such a silly claim. There is only one thing you can do really - write a post about it. Some background which is important because it makes it clear why this is no simple misunderstanding or mistake. I had been reading stuff about how US growth in 2013 refuted the Keynesian position on austerity. 2013 was the year of the sequester, when many economists had voiced concerns about how a sharp fiscal contraction could derail US growth. Growth in 2013 turned out to be modest, and this led some to argue that this modest growth had refuted Keynesian economics. So I thought I’d do a simple calculation, discussed here. I took the data series for government consumption and investment (call it G), and computed what growth would have been if we assumed an instantaneous multiplier of 2 and no austerity. If the 2013 experience really did refute the Keynesian position, then my counterfactual calculation of growth without austerity would have given some implausibly large number. I choose a multiplier of 2, because that rather large number would give the Keynesian analysis a real test. I did the same for earlier years. The counterfactual number I got for 2013 growth was 3.7%, rather than actual growth of 2.2%, with similar growth rates for earlier years. Hardly an implausible number for a recovery from a deep recession with interest rates still at zero, so no obvious refutation. Scott Sumner then wrote a post where he said three things in particular. He goes on to say that this claim is absurd, which of course it is. The only problem is that I never made it, or anything like it. In fact I obviously thought the opposite. Could this be a simple misunderstanding? There are two reasons why not. The first was that my counterfactual with no fiscal contraction had raised growth from 2.2% to 3.7% in 2013. That would not happen if there had been no austerity in 2013. The second was that I had reproduced the data which clearly shows continuing austerity in 2013! So this was no misunderstanding, or even exaggeration. It is difficult to know what else to call it other than a straightforward lie. Sumner also says in this latest post that I’m using the wrong variable: rather than G I should use a more comprehensive measure including taxes and transfers, because G is not the variable used to measure austerity in the Keynesian model. But he must know that macroeconomists use both G and some measure of the deficit to look at short term fiscal impacts, for a simple reason. Consumers can smooth the impact of tax and transfer changes, while the impact of G is direct. So equating a $ worth of cuts in G with a $ tax increase, as a deficit measure would do, is wrong: particularly if timing is important, which in this case it is. So using G is a pretty standard thing to do. In this case, however, it does not seem to make much difference. Here is the IMF WEO series for the US structural deficit. It shows a very similar pattern to G. Austerity starts in 2011, and continues thereafter. When the New Statesman asked me to write something on Osborne’s budget surplus law, they also suggested I talk about what Labour’s attitude should be. Space constraints meant that I could not say much on the second question, so let me amplify here. Let's start in 2009. The Labour government's policy at the time was absolutely right. They provided fiscal support for the economy in the midst of the recession even though it meant increasing the deficit. Given the belief at the time that the recession might be short lived their policy was also quite clever, using a temporary cut in VAT as a close proxy for looser monetary policy. What line should they have taken in 2010? I remember reading some reports that Gordon Brown initially wanted to continue placing the recovery above the need to reduce the deficit. If true, he was right. However it was perhaps inevitable that Labour began to also focus on deficit reduction: the recovery looked like it had begun, the debt problems in the Eurozone were constantly in the news, and the Conservatives and much of the media were saying we could become like Greece. So they instead fell back on the idea that recovery could be achieved at the same time as implementing policies designed to reduce the deficit. We can call this the ‘too far, too fast’ period, from the mantra Ed Balls used to criticise George Osborne’s policy. I have seen two reasons given for why Labour chose not to defend its record: Miliband wanted to establish his independence from a government that had lost an election (to ‘move on’), and it was thought that the Coalition strategy of blaming the last government would lose its potency after a year or two. The second argument proved horribly wrong. Instead the ‘clearing up the mess’ line was used to blame Labour for damage caused by 2010 austerity. It was complete nonsense, but it worked. In a way 2011 and 2012 were too easy for Labour: the economy was stagnant and Osborne looked vulnerable. But Labour should have anticipated that growth would return at some point before the election - if I could, surely they could. They will not have anticipated the stagnant productivity that allowed unemployment to fall so rapidly, but in political terms growth would have probably trumped high unemployment anyway, as I suggested back in 2012. What should have happened in 2012 is that the ‘too far, too fast’ line should have changed to become a full blown attack on austerity: that was their second big mistake. By 2012 it was obvious that fears about a UK debt crisis had been completely overblown. The problem with ‘too far, too fast’ is that it sounded like austerity-lite: the need to focus on the deficit was conceded. Labour could have easily got away with changing its line at this point. They could have said that we thought there was a debt funding problem, but now we know there wasn’t. The argument that austerity should be postponed until the recovery is assured (i.e. when interest rates are well away from the Zero Lower Bound) was right in terms of the macroeconomics, but it would also have allowed Labour to combat the ‘clearing up the mess’ line, and profited from Osborne’s move to plan B. Instead Labour seemed to be constantly triangulating between sensible macroeconomics and what the focus groups were telling them, and thereby producing a policy that failed to convince. Their fiscal policy proposals going into the 2015 election were much more sensible than George Osborne’s, but instead of attacking his renewed austerity they tried to pretend that they too were ‘tough on the deficit’. It was left to the SNP to argue against austerity. The problem was that instead of presenting a clear alternative vision, Labour looked like it was always playing catch-up with Osborne. As John Curtice writes: “the Achilles’ heel of Labour’s campaign appears to have been a failure to convince those who were sceptical about the Conservatives’ economic record that Labour offered an attractive alternative.” As Lord Ashcroft’s polls show, and as I noted sometime before the election, by 2015 around half the public were against the continuation of austerity, yet Labour’s message on this was confused. Today Labour continues to think that triangulating on the deficit, or worse just copying Osborne, is the answer. I think this tells us a great deal about the Labour party. That it is light on good macroeconomic advice and expertise, of course. But also that it spends too much time listening to people in the Westminster bubble and fails to spend time thinking about basic electoral strategy. What Labour needs to ask now is what will prevent the Conservatives convincing the electorate in 2020 that Labour just cannot be trusted on the economy? Admitting their past fiscal mistakes when in government now, however much that is partial and hedged, will just give ammunition to their opponents in five years time. (Just read this, and extract the quotes.) More serious still, by allowing the focus to remain on the deficit, it lets Osborne get away with the damage he inflicted in 2010-2012, and the continuing social costs of austerity. What is the point in talking about the record on growth or productivity, when you appear to have conceded that reducing the deficit is all important, and Osborne is doing plenty of it? In my New Statesman piece I say it is still not too late to change tack, stop triangulating and try something new - to start telling the truth. But I think there is a danger that this sentence frames the discussion in the wrong way, so it appears to be a contest between pursuing the right policy and winning elections. This post is all about the best way of regaining economic credibility, which means taking a strategic view rather than looking at what sounds good to today’s focus group. Put simply, if around half the electorate already think austerity should not continue, why on earth are Labour giving in to deficit fetishism? In electoral terms, the fact that attacking austerity is also good macroeconomics is just a bonus. Statements like this tell us rather a lot about those who make them. As statements about why people hold macroeconomic views they are wide of the mark. Of course there is confirmation bias, and ideological bias, but as the term ‘bias’ suggests, it does not mean that evidence has no impact on the views of the majority of academics. The big/small government idea makes no theoretical sense. Why would wanting a larger state make someone a Keynesian? Many Keynesians, and most New Keynesians, nowadays acknowledge that monetary policy should be used to manage demand when it can. They also know that any fiscal stimulus only works, or at least works best, if it involves temporary increases in government spending. So being a Keynesian is not a very effective way of getting a larger state. It is also obviously false empirically. In the UK and US a large majority of economists appear to hold Keynesian views. I think it rather unlikely that a similar majority want a large state, and I can think of some notable Keynesians who clearly do not. Central bank models are typically Keynesian. Does that mean central banks want a larger state? No, it means the evidence suggests Keynesian economics works. To illustrate their belief that Keynesians ignore awkward facts both the authors above use the example of US growth following the 2013 sequester. (In my experience anti-Keynesians tend to shy away from data series, and especially econometrics, and prefer evidence of the ‘they said this, and it didn’t happen’ kind - particularly if ‘they’ happens to be Paul Krugman.) The problem is that this episode actually illustrates the opposite: that anti-Keynesians are so keen to grasp anything that appears to conflict with Keynesian ideas that they fail to do simple analysis and ignore others that do. Why do we have to go over, yet again, that the clear majority of studies show that Obama’s stimulus worked. 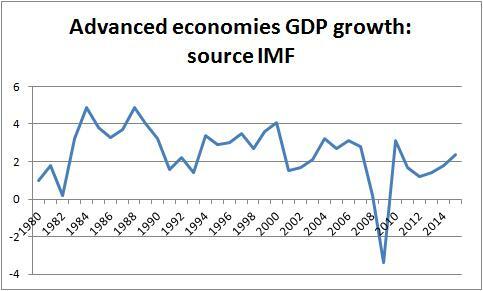 Why do we have to keep going over why UK growth in 2013 does not prove austerity works? Why do these people never mention the meta studies that confirm basic Keynesian analysis of fiscal policy? Because they want to believe that the “evidence is a mess” so they can carry on holding their anti-Keynesian views. Parts of the political right have always had a deep ideological problem with Keynesian analysis. As Colander and Landreth describe, the first US Keynesian textbook was banned. New Classical economists, for all the many positive contributions they brought to macro (in the view of most mainstream Keynesians), also tried to overthrow Keynesian analysis and they failed. When anti-Keynesians tell you that support or otherwise for Keynesian macroeconomics depends on belief about the size of the state, they are telling something about where their own views come from. When they tell you everyone ignores evidence that conflicts with their views, they are telling you how they treat evidence. And the fact that some on the right take this position tells you why anti-Keynesian views continue to survive despite overwhelming evidence in favour of Keynesian theory. The Guardian today publishes a letter from 79 economists, including yours truly, about George Osborne’s plan to outlaw government budget deficits in normal times. I’ve written two recent posts on this, so I will not go through the issues again here, but I thought I’d say a couple of things about the business of signing letters and whether they are worth the effort. The first is whether the reader or potential signatory should worry about the details of the text of multi-signatory letters. You might think the letter could be better written, and someone asked to sign it might think they could have put it much better themselves. The person asked to sign might agree strongly with the overall message of the letter, but could have some misgivings about particular sentences. The problem of course is that, because the letter is signed by X number of people, where X is large, having all X making their own attempts at redrafting becomes a nightmare in coordination. So these letters should never be read for the details of the text, but instead for their overall message. The second is whether there is any point in these multi-signatory letters from economists. Alan Manning makes a number of good points here. When these letters involve issues where there is genuine division among economists, then a letter followed by a counter letter just encourages further jokes about economists never agreeing. (But because there is some news value in getting in first, letters on this type of issue keep coming.) The letter format is also too short for making proper arguments: other forms of media are better in that respect. That argument does not I believe apply to this particular letter, or to the other which I recently signed on the Greece-Troika negotiations. In both cases there is probably a clear majority view among economists. Multi-signatory letters then have an important information value to both readers and political commentators. This brings us - inevitably - to perhaps the most famous example in the UK of such a letter, from 364 economists protesting at Margaret Thatcher's 1981 deflationary budget. It is also a good example of not worrying too much about the text, as I’m sure many/most who signed that letter would have found at least one sentence objectionable. If you have previously heard about this letter it may well have been accompanied by a comment on how the letter is now ‘generally regarded’ as reflecting badly on economists. The reasons for this view are in themselves interesting. Ask anyone on the political right, and they will tell you this is because Margaret Thatcher was correct and the economists were wrong. But you can equally well make the opposite claim. The economic strategy at the time was monetary targeting, and that policy in itself failed dismally: monetary targets were hopelessly missed and the policy framework was abandoned shortly after the letter was written. In terms of overall outcomes, it took two decades before UK unemployment returned to pre-1981 levels. So why is it ‘generally regarded’ as reflecting badly on economists? Essentially because many supporters of Conservative governments - some economists but also many politicos - have gone out of their way to say so. (I go into more detail in this post.) As we have witnessed recently, the political right tends to be much better than the left at rewriting history for its own purposes. But that in itself is a form of flattery. Why bother to spend time and effort rubbishing a letter from 364 economists unless that letter, and any similar letters that might follow it, had some impact? So maybe letters from economists on issues on which most economists agree are important and can have some small influence. Interviewer. Chancellor, in your Mansion House speech you said we must reduce government debt rapidly to prepare for an uncertain future. What uncertain future do you have in mind. Osborne. As my colleague the Prime Minister put it just six months ago, red warning lights are once again flashing on the dashboard of the global economy. There is Greece, the Middle East, and Ukraine. Interviewer. But Chancellor, economists are agreed that any imminent global downturn will be more difficult to deal with if fiscal austerity is also being a drag on growth. Osborne. I am confident that the Bank of England can deal with any immediate threats to the economy. Interviewer. Even with interest rates already near zero? Osborne. As the Governor has often said, he has the tools to do the job. Interviewer. Is that why inflation is currently negative? Osborne. As you know that has a great deal to do with the fall in oil prices. More generally I think we should celebrate the fact that prices have stopped rising so that real wages and living standards can at last increase. Interviewer. But isn’t core inflation, that excludes oil prices, at 0.8%? The 2% inflation target is yours, Chancellor. Mark Carney has also said that reducing fiscal deficits will be a drag on growth. Osborne. To repeat, I have complete confidence in the Governor of the Bank of England to keep the economy on track. I have not been disappointed in my choice of Governor so far, but if I need to reprimand him for any failures in the future I will not shirk from that responsibility. Interviewer. Going back to the proposed legislation to outlaw deficits, you have also made election commitments to cut some taxes, and intend to legislate to outlaw raising others. That means that public spending will have to be cut to achieve these surpluses. Some people have suggested these laws are just a backdoor means to achieve an ideological objective of a smaller state. Osborne. That is nonsense. I just think it is important not to place any further burden on this country’s hard working families. These families also know that you cannot go on borrowing forever. Interviewer. Many people borrow for years to buy a house, and many successful companies continue to borrow to grow. These companies also know that it is best to borrow when interest rates are low, and interest rates on UK government debt are currently very low. Osborne. And I will never stop trying to take credit for that. But as a prudent Chancellor, I need to ensure we have room to run deficits safely in abnormal times. Interviewer. Is that to enable the government to undertake fiscal stimulus to support the economy during a major recession? Osborne. No, that would not be appropriate, as I said in 2009. But as I have also said many times, it is important to allow the automatic stabilisers to operate. Interviewer. The automatic stabilisers operate even during mild economic downturns, because low growth reduces tax revenues for example. So does your definition of abnormal simply mean when growth would be below average? Osborne. No, I am talking about more serious events than that, but I will leave the experts at the OBR to decide precisely what is abnormal. Interviewer. I am sure they would welcome your guidance. But if abnormal does not include mild downturns, and you want to make it a legal requirement to run surpluses during those times as well, that will require either switching the automatic stabilisers off during these mild downturns, or running pretty large surpluses when the economy is on track so as to avoid going into deficit if a negative shock of the normal kind hits. Osborne. As I said, I think it is important to allow the automatic stabilisers to operate. Interviewer. Chancellor, I may be being stupid here, but why is it important to allow taxes to fall automatically in a recession, but wrong to actually cut taxes further to help bring the recession to an end quickly, particularly if interest rates are stuck at zero? Osborne. I think the experience of 2010 shows us the limits of what governments should do. It was right to let the automatic stabilisers increase the deficit following the 2009 recession, but any action by the government to increase those deficits puts our credibility at risk. Interviewer. Now I’m a little confused. You and your colleagues said repeatedly during the recent election that the deficit in 2010 was so large due to the profligacy of the last Labour government, and not because of the recession. Austerity was because you had to clear up the mess that Labour created. It also seems that a significant proportion of the public sees it that way too. Are you now saying that is wrong? Osborne. Look, no one is denying that 2008 saw a global financial crisis. It is to prepare for that kind of event that we need to run surpluses, perhaps as you suggest quite large surpluses when the economy is growing normally, to get debt down quickly. Interviewer. So we need to bring debt down rapidly so that we can afford to bail out the banks again when the next financial crisis hits. I thought you had taken the measures necessary to prevent us having to rescue the banks again. Osborne. We have done what we can, but it is important to maintain London as the leading financial centre, which means keeping banks profitable and allowing them to pay large bonuses to attract the best international talent. We do not want to impose regulations so severe that these banks and other financial companies go elsewhere. We made these points many times before 2008. Interviewer. Thank you, Chancellor. That has been very helpful in understanding why you believe we need to legislate for budget surpluses. One last question if I may. Can you tell me what percentage of donations to the Conservative party come from the financial sector? Does it make sense to target a budget surplus in normal times within five years, as George Osborne suggested at the Mansion House last night? I’m afraid any answer to that has to first respond: define ‘target’ and ‘normal’. We do not have those details at the moment, so I’ll try and finesse them by asking whether it makes sense for the budget to be on average in balance within five years: more surpluses than deficits, but the occasional (abnormal) large deficit. In this post I’ll ignore problems associated with the Zero Lower Bound for interest rates, which is a very good (irrefutable?) reason why we should not be seeing any fiscal tightening right now. Here I’ll focus on the longer term. This question is really the same as asking what the long run target for government debt should be. I recently discussed an IMF paper which suggested that, as long as the market was happy buying the debt, there was no need for the government to reduce the level of debt from current levels (around 80% of GDP). That policy would imply running deficits of around 3% of GDP, which is a long way from a surplus. I also said that might be an extreme position. In this post I gave various paths for deficits and debt, where the other extreme was balancing the budget. A balanced budget could involve debt falling rapidly to around 40% of GDP by 2035, and by 2080 the debt to GDP ratio would be close to zero. I also gave various paths in between these two extremes. So which should it be: keep the debt to GDP ratio at around 80% as the IMF suggest, or get it to fall rapidly as George Osborne suggests, or something in between? Consider some popular arguments for going with George Osborne. 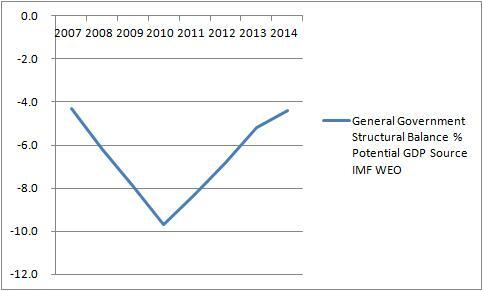 1) It provides scope to respond to another Great Recession without running out of what the IMF call fiscal space. This is right in principle, but the numbers do not imply we need to get debt down that fast, unless we are expecting the equivalent of Great Recessions to happen in the future much more often than in the past. The IMF paper has some calculations on this (pages 12 and 13), and I looked at a particular experiment here. 2) We need to reduce the debt burden for future generations. Under the assumptions in the IMF paper, the costs of getting debt down now exceed the future benefits. Again, that might be too extreme, but it would be very hard to justify a quick Osborne like reduction in debt on distributional grounds. That would mean that the costs of reducing debt would largely fall on the same generation that suffered as a result of the Great Recession, which would seem perverse. Bad analogy. Here a country is more like a firm. Firms typically plan to live with permanent debt, because it has paid for its capital. The state has plenty of productive capital. To put the point in distributional terms, if we paid back most government debt within a generation, we would be giving that capital to later generations without them making any contribution towards it. So it is hard to justify aiming for budget surpluses within the next five years. But I want to make one final point. How quickly you should reduce debt involves difficult technical issues. While I’m reasonably sure that the extremes of keeping debt at 80% of GDP or going for surpluses within the next five years are not optimal, that leaves a wide range of possibilities in between, and neither theory nor evidence gives us much guidance at the moment. This really is an area where more research is needed , and it would be good if the Treasury - the main interested party - was promoting that research. What we get instead are jokes about reactivating the Commissioners for the Reduction of the National Debt. (It was a joke, surely?) Sign of the times, I’m afraid. It makes no sense to target any deficit/surplus number on an annual basis. The budget deficit should be a shock absorber, to prevent volatility in things that matter, like tax rates and spending decisions. (Shocks can be cyclical, but they can arise from other sources, so cyclical correction - even if it could be done well - does not negate this point; see Portes and Wren-Lewis.) That is why the coalition originally had a target for the deficit in five years time, which makes sense because it allows the deficit to be a shock absorber. Yes I know this is what academics always say, but on this issue it is absolutely true. Compared to the oceans of work on monetary policy, work on optimal government debt amounts to a puddle. One reason may be that central banks are good at encouraging and utilising academic research, whereas finance ministries are less so. Part of the deliberate mystification that goes on here is to present Eurozone exit as if it somehow automatically follows if there is a Greek default. But of course Greece has already defaulted, and it remains in the Eurozone. Greece wants to remain in the Eurozone. 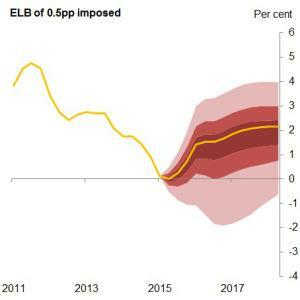 What will stop them if they do default will be a run on their banks, and a refusal of the lender of last resort for their banks - the ECB - to act in that capacity. Again this will be presented by the ECB as inevitable given the ECB’s own rules. But as Karl Whelan points out, the ECB in reality has considerable discretion, and it has been using that discretion in its role as part of the Troika. Still, even if the sides are a little unequal in their power, is it still just a battle over resources? One side advocates left wing/populist/humanitarian policies and the other side policies that are more of the consensus/neoliberal/tough variety. One side has suffered a massive fall in GDP partly as a result of previously agreements, while the other is negotiating over what is to them peanuts. So there is plenty of opportunity to pick sides based on preferences. Both sides would almost certainly be better off with an agreement, so it also makes sense for people to appeal for flexibility, which is why I signed this letter. But to pick sides, or to call for flexibility from both, misses the main point. Yes, this is a battle over resources, but it is a battle where one side is using its power to pursue a policy that is very short-sighted, involving incredible hubris, and which is ultimately self defeating. The Troika are not acting in the long term interests of those they represent. This is I believe what Amartya Sen was saying when he compared these negotiations to the Versailles agreement. The most obvious example of this are the Troika’s continuing demands for positive primary surpluses and the austerity measures required to achieve them. This is just stupid. It continues to waste large amounts of valuable resources, as well as inflicting real suffering. It certainly is not in the interests of Greece, but it is almost certainly not in the interests of the creditors either. If you shrink the pie, you are less likely to get the amount of pie you have a claim to. (Martin Sandbu goes through the maths here.) It is disgraceful that key parts of the IMF plays along (or worse) with this. In the past I have described how heterogeneous the IMF is, but taking absolutely no notice of what your own research department says about austerity is crazy. Ambrose Evans-Pritchard talks about the Fund's own credibility and long-term survival being at stake. Keynes, who helped found the organisation, would be turning in his grave. The hubris of the Troika is incredible. They have convinced themselves that they must override the democratic wishes of the Greek people because the Troika have the wisdom about what is good for the Greek economy. This is the same body that with its superior wisdom prevented full default, and imposed ridiculously strong austerity on Greece and crashed the economy as a direct result. To cover up these errors they play to stories in the media about the lazy and privileged Greek people, stories that largely disintegrate when confronted with evidence. Now they shrug their shoulders and say I have to keep on the same disastrous path because my electorate gives me no choice! Amartya Sen is right. This is our Versailles treaty moment. It could be so very different. No doubt some of Syriza’s mandate may be unwise, but their own economists may recognise that and welcome the excuse to shelve them. The Troika and Syriza’s negotiating team could be cooperating in that endeavour, but I’m pretty sure that is not what is happening. On austerity the priority of the Troika should be to eliminate the Greek output gap, which means in the short term less rather than more austerity. This would not just be in the interest of the Greek people but also the interests of the rest of the Eurozone. This is why I think these negotiations are less like bargaining over a mutually beneficial exchange (rolling over lending in exchange for reforms), and more like a discussion with a mugger over which of your personal possessions you hand over. Or add any other description you prefer - my point is that they differ and people have strong views about them both in principle and practice, and therefore pick sides accordingly. [3, postscript] Karl Whelan shows here that Giavazzi’s piece is as grounded in facts as some other FT op-eds. I recently had the privilege to speak in Berlin at the 10th anniversary celebration of the Macroeconomic Policy Institute (IMK). (The talk I gave, on the Knowledge Transmission Mechanism, is here if anyone really wants to watch it.) I had known about the IMK for some time through reading incisive posts by Andrew Watt on the Social Europe website, but more recently I had been citing important papers by other IMK economists looking at the costs of austerity. You could describe the IMK group within Germany in various ways (see below), but one would be an island of Keynesian thinking in a sea that was rather hostile to Keynesian ideas. A mistake here may be to focus too much on macroeconomics. Germany has recently introduced a minimum wage: much later than in the UK or US. I think it would be fair to say that German economists generally advised against this. In the UK and US the opinion of economists on the minimum wage issue is much more balanced, largely because there is a great deal of academic evidence that at a moderate level the minimum wage does not reduce employment significantly. So here German economics also appears to be an outlier. One of the distinctive characteristics of the German economy appears to be very far from neoliberalism, and that is co-determination: the importance of workers organisations in management, and more generally the recognition that unions play an important role in the economy. Yet I wonder whether this may have had an unintended consequence: the polarisation and politicisation of economic policy advice. The IMK is part of the Hans-Böckler-Foundation, which is linked to the German Confederation of Trade Unions. The IMK was set up in part to provide a counterweight to existing think tanks with strong links to companies and employers. If conflict over wages is institutionalised at the national level, perhaps the influence of ideology on economic policy - in so far as it influences that conflict (see footnote ) - is bound to be greater. As you can see, I remain some way from answering the question posed in the title of this post, but I think I’m a bit further forward than I was. On this isolation see Tony Yates here. At the end of this post Tony also references an interesting discussion regarding ordoliberalism and other issues in comments on a post of my own: see here.